Chombo recently told farmers at a field day that they were not free to join a party of their choice because they were given land by the Zanu PF-led government. 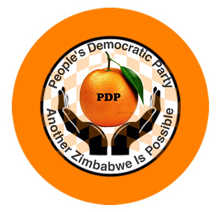 PDP spokesperson Jacob Mafume said the utterances are disturbing and unconstitutional as the liberation party has no legal standing to deny any citizen land as punishment for supporting different political parties. “Such words warrant a high-level sanction. Chombo must be punished for what he said, he must at least resign and apologise thereafter. The opposition party said Zanu PF has for long held Zimbabweans at ransom, trampling on people’s rights because it liberated the country from British rule. “While some of the people in Zanu PF were part of the liberation struggle, it is also important to note that other movements were involved in the liberation struggle,” said Mafume. “The masses outside the active political organisations also played a pivotal role supporting the fighters with food and information among other things. Critics accuse President Robert Mugabe’s government of abusing public resources to amass wealth at the expense of masses. Mafume said government must guarantee ownership of land through the provision of title deeds. “Title must be given to those who occupy land to ensure security of tenure, we know Zanu PF resists because they intent to continuously maintain a leash on those who own land. “Beyond that title empowers the new farmer with borrowing capacity which is critical for productivity on the farms,” Mafume said. The Tendai Biti-led party said Chombo must, instead, surrender some of his multiple farms and choose one then encourage his colleagues in Zanu PF to do the same.